Process intelligence is an effective means to analyze and improve business processes in companies with high degree of automation. Hospitals are also facing high pressure to be profitable with ever decreasing available funds in a stressed healthcare sector, which calls for methods to enable process management and intelligent methods in their daily work. However, traditional process intelligence systems work with logs of execution data that is generated by workflow engines controlling the execution of a process. But the nature of the treatment processes requires the doctors to work with a high freedom of action, rendering workflow engines unusable in this context. 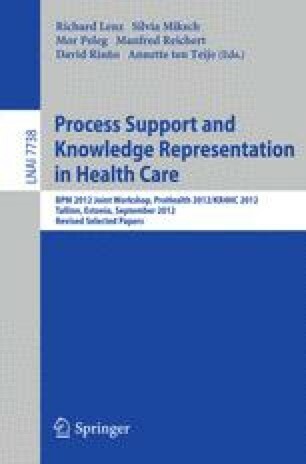 In this paper, we introduce a novel method to conformance checking that computes fitness of individual activities in the setting of sparse process execution information, i.e., not all activities of a patient’s treatment are logged. We embed this method into a process intelligence approach for hospitals without workflow engines, enabling process monitoring and analysis. This work is supported and funded by the German Federal Ministry of Education and Research (01IS10039B).